Enhance your deck, sun room, patio or porch with beautiful patio doors from Feldco. Milwaukee homeowners choose Feldco for their patio doors because they’re strong, energy efficient and we offer an array of customization options to match any home. 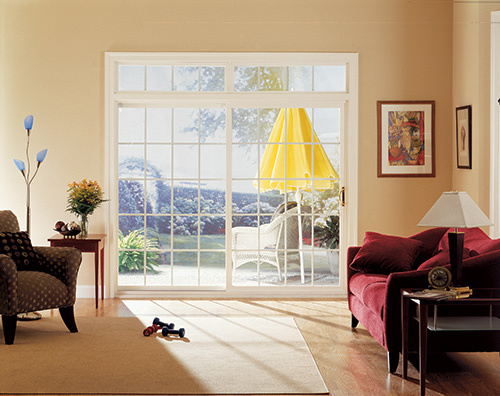 You can choose from sleek, vinyl sliding patio doors or elegant French patio doors. Our sliding patio doors are made from high quality, premium vinyl, similar to our windows. In fact, you can think of our sliding patio doors as a giant sliding window. They’re equally energy efficient and will stand up to any weather Milwaukee has to offer. Our sliding patio doors will give you easy access to the outdoors. They slide on a track and can even be opened and closed with very minimal effort. Sliding patio doors from Feldco feature two large sashes with one being operable and one fixed. Any room they’re installed in will be brighter and feel larger and more open. If you prefer to have more privacy, you can choose to have grids or even built-in blinds installed on your sliding patio doors. Since our sliding patio doors are made similar to our windows, they’ll never warp, rot or crack during the harsh weather of Milwaukee. Are you looking for a more elegant and traditional look for your home? If so, then you should consider French patio doors. Our French patio doors are made just like our steel and fiberglass entry doors and have all the same benefits. Another feature of our French patio doors is you can choose between two and three lite systems and which doors are operable and inoperable. French patio doors will provide a look for your home that you can’t get with anything else. Whether you choose a sliding patio door or French patio door, you’ll know that it’ll stand up to any weather in Milwaukee and look and perform great for many years to come. Your home will look great, feel great and you’ll save money on energy bills thanks to our patio doors’ high quality construction.